This is a note from Hector from Hawaii and I thought you'd all appreciate seeing the spectacular photo plus a description of how it was made and for what special occasion! Note from Hector: Last Saturday, my younger cousin Keith Chan graduated in Civil Engineering. He organized a lovely dinner for our ENTIRE family which turned into a family reunion of 80. My relatives has seen me baking since I started with The Cake Bible back in 1989, but they have not seen any of my recent work, so I offered to make cake and attempt to re-introduce myself as a baker. My first cake from the book was the Golden Cage which I have a picture I dare $$$ to ever share publicly. 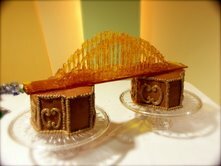 I felt the responsibility to do something with caramel....how about a caramel bridge? If it didn't turn out, my cousin could fix it! Here it is. The vertical ropes of the bridge were done by pouring caramel onto every other groove of corrugated cardboard lined with aluminum foil. Honestly, the technique is here, but I would execute this cake again, a little more carefully and precisely to make it look prettier and less heavy: I inserted Mc Donald's drink straws in the cake to prevent the bridge from smashing! I ran out of time that evening and showed up late at the dinner, never again because when you show up late no-one sees your cake! I do have a few pictures with my cousin and my nieces with the cake, but besides that people admired the cake mostly for its flavor when served.